PhD. in Sustainable Suppl Chain Management from University of Kassel, Germany. Sustainable supply chain management, Supply chain design, Base-of-the-pyramid, B2B market. 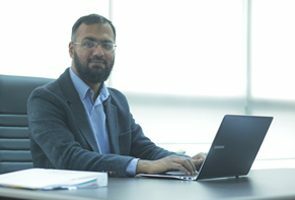 Prior to joining ITU, Dr. Usman Khalid is an assistant professor at School of Business and Management in ITU. He earned his masters and doctorate from University of Kassel, Germany. During the course of his doctorate he worked as part of a research group established under the title of International Center for Development and Decent Work in University of Kassel, Germany. His doctoral research was related to sustainable supply chain issues encompassing informal markets of developing economies. Before joining ITU he has been teaching different supply chain and operations management related courses in University of Kassel. His research interests in supply chain and operations management field encompass such topics as purchasing, supply chain design, strategic operations management, logistics and base-of-the-pyramid. He regularly presents his research work in such international forums as NOFOMA, EurOMA and DSI. He remains an active member of such research-oriented societies as Production and Operations Management Society and European Operations Management Association. His research articles have been published in such international journals as Supply Chain Management: An International Journal and Journal of Business Ethics. Khalid, R.U., Seuring, S. (2017), “Analyzing Base-of-the-pyramid research from a (sustainable) supply chain perspective”, Journal of Business Ethics, DOI: 10.1007/s10551-017-3474-x. Khalid, R.U., Seuring, S., Beske, P. Land, A., Yawar, S.A. and Wagner, R. (2015), “Putting sustainable supply chain management into base of the pyramid research”, Supply Chain Management: An International Journal, Vol. 20 No. 6, pp. 681-696. Khalid, R.U., Seuring, S. (2018), “Deficiency/fragility premiums in B2B supply chains in BoP”, Post Conference Proceedings of 5th International EurOMA Sustainable Operations and Supply Chain Forum, 5-6 March 2018 – Kassel, Germany. Khalid, R.U., Seuring, S. (2017), “Supply chain practices influencing firm’s purchasing performance in base of the pyramid”, Post Conference Proceedings of 29th NOFOMA Conference – Nordic Logistics Research Network, 8-9 June 2017 – Lund, Sweden. Khalid, R.U., Seuring, S. (2017), “Sustainable supply chain practices effecting firm performance in base of the pyramid”, 4th EurOMA Sustainable Operations and Sustainable Supply Chain Forum, 27-28 February 2017 – Milan, Italy. Khalid, R.U., Seuring, S. (2016), “Supply Chain Practices at the Base of the Pyramid”, in Schaltegger, S. (ed. ): Two decades of corporate environmental and sustainability accounting – What has been achieved? Proceedings of the 20th EMAN Conference, 22-23 September 2016 – Lüneburg, Germany. Khalid, R.U., Seuring, S. (2015), “Integrating sustainable supply chain management (SSCM) and base of the pyramid (BoP) research approaches: A literature review”, Post Conference Proceedings of 27th NOFOMA Conference – Nordic Logistics Research Network, 3-5 June 2015 – Molde, Norway. Monzer, D. A.; Rebs, T.; Khalid, R. U.; Brandenburg, M. (2018), “Sustainable supply chain management at the base of pyramid – A literature review”. In: Brandenburg, M.; Hahn, G. J.; Rebs, T. (eds. ): Social and Environmental Dimensions of Organizations and Supply Chains: Trade-offs and Synergies. Series: Greening of Industry Network Studies; Springer, Berlin. Supply Chain Sustainability at the Base of the Pyramid.